No match on the card of WrestleMania 35 had the intrigue and passion of the main event. 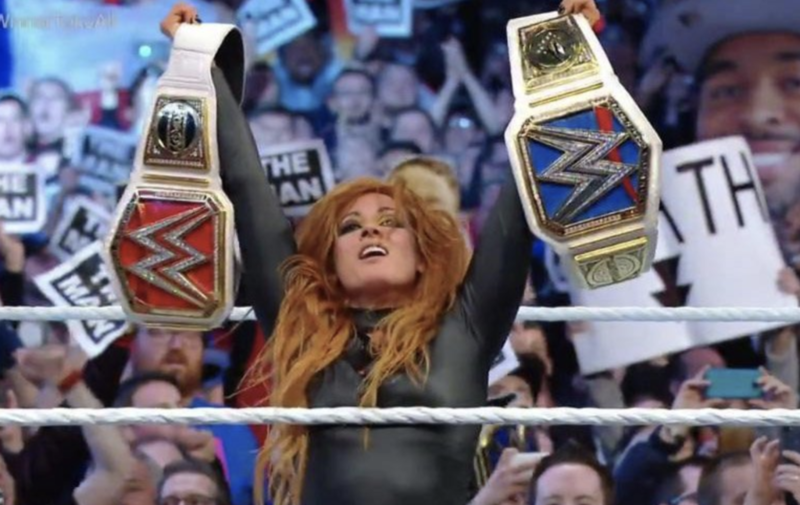 The combustible personalities of RAW Women’s Champion Ronda Rousey, SmackDown LIVE Women’s Champion Charlotte Flair, and fan favorite Becky Lynch all but forced their way into the main event of WrestleMania. Three of WWE’s hottest Superstars going to war over two championships in a Winner Take All match. Now that’s what we’re talking about. Let’s get to the recap. Just in case you were wondering about the presence here, Charlotte Flair arrives in a goddamn helicopter with the SmackDown Women’s Championship around her waist. It’s a move only “The Queen” could pull off. Rousey has her own power move, coming out with the actual Joan Jett playing “Bad Reputation.” Then “The Man” is here with nothing but her entrance music and a whole lot of swagger. Can you say “BIG FIGHT FEEL”? Becky goes for a Disarm-Her on Ronda early, gets pummeled into the corner, and all while Charlotte just watches. They all fight to the outside, and Ronda is looking dominant early, laying out Becky and Charlotte with Piper’s Pit until Charlotte delivers a massive fallaway slam into the barricade. With Rousey down and out, Becky and Charlotte square off in the ring. It’s vicious and intense, the former best friends going to town on each other. They go for each other’s finishers, but have them scouted, and Ronda gets back in the ring… only to be double teamed by Lynch and Flair, the “Rowdy One” dropping to the floor when Lynch hits her with a nasty looking dropkick that once again sends her to the outside. Back in the ring, Charlotte goes for a moonsault but Becky counters into a Disarm-Her, a deadly finisher that Ronda breaks up before Charlotte can tap. With Ronda and Becky prone, Charlotte hits them both with Natural Selection, but can’t get a pinfall victory. She sends Becky to the outside and then hits Ronda with some chops, but Ronda asks for more. She begs for more, in fact, and then locks in a submission on Charlotte. There’s no real room to get a submission here though, as each woman is keeping an eye out and breaking up the moves. So, Becky lays them both out and goes for pins, but it’s too early to put Ronda and Charlotte away. Charlotte heads to the top rope, and Becky meets her there with an avalanche Bex-ploder. That gives Ronda an opening to connect with a double crossbody, but again, it’s too early for a win. She locks in an armbar on both women, and that forces Charlotte and Becky to work together to deliver three powerbombs as a team. Becky goads Charlotte into running into the ropes and gets a near fall off the ensuing slam. That leaves Becky and Ronda to battle it out. Becky locks in a Disarm-Her and keeps rolling through to keep it locked in as Ronda tries to get to the ropes. She makes it, and that allows her some leverage to pick Becky up and get out of the submission. From there, Charlotte sends Ronda to the outside, seeing this as her opportunity to take out an exhausted Becky Lynch, but a Spanish Fly off the top doesn’t get the job done. All three women are desperate to end this match, to become both RAW and SmackDown Women’s Champion. They’re doing everything they can to get the win. Charlotte targets Ronda’s leg, slamming it against the ring post before locking in a nasty Figure Four around the post. In the ring, Charlotte locks in the Figure Eight on Ronda, but Becky breaks up the potentially match-winning submission with a leg drop from the top. With Triple Threat rules meaning no disqualification, Becky Lynch decides it’s time to get some tables. She sets one up in the ring, but Ronda takes it down, saying she doesn’t need a weapon to win. She goes after Becky, but Charlotte comes back in and spears both of them, getting near falls, but no wins, on both women. Charlotte’s feeling it, and she sets up the table in the corner. She slams Rousey against it, and then spears Becky and gets another near fall. Everyone is coming so close, but no one can get it done and walk out as a double champion. Charlotte goes for another spear on both women, but they throw her through the table. That leaves Becky and Ronda to battle it out. Ronda hits Becky with a brutal running knee, and then sets up Piper’s Pit. She follows through with the move, but Becky manages to reverse the move just enough so that the follow through sends Ronda to her back. That means her shoulders are down (or were they? ), and the ref counts 1, 2, 3 as Becky Lynch completes her journey and gets a shocking victory in the historic main event of WrestleMania. She’s both RAW and SmackDown Women’s Champion. The question is…for how long?